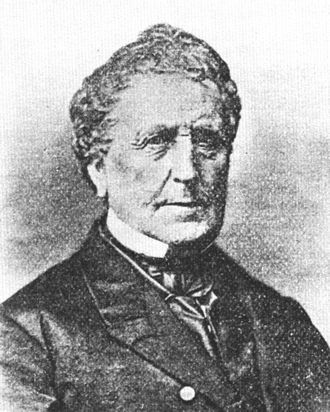 John Orchard was born in Devonshire, England, where he died, aged about 80 years. 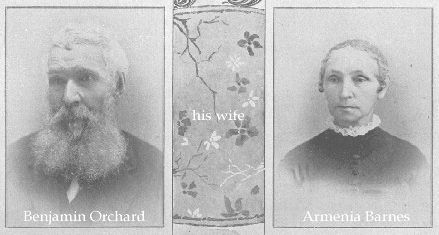 His wife, Sarah, bore him 16 children, among whom was Abraham Orchard, who died in Devonshire at the advanced age of 86 years. He married Prudence Pering, of Devonshire, and they had four children, among whom were Benjamin Orchard and Martha, christened 4 June 1799 at Chard Street Chapel-Independent, Axminster, and wife of George Membery. 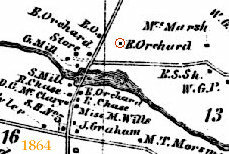 Benjamin Orchard removed to Hounsfield, Jefferson Co., New York, in 1832 on a farm at the northeast corner of Old Salt Point Road and Parker Road. He married Armenia Barnes, daughter of Rev. Enoch Barnes and Amor Hazen, of Hounsfield, and their children were Matilda, Sarah, Elsie J., Richard, Benjamin, Julia A., Martha A., Effie E., Darius, Ada R., and Ida M. Orchard. A record in the county clerk's office shows that on 2 September 1859, Col. Elisha Camp and wife Sophia Hale of Sackets Harbor sold all of the real estate known as Camp's Mills, consisting of a saw mill, grist mill, stone house and about ten acres of land east of the road to Benjamin Orchard for $1,000. Benjamin continued operation of the mills, and he is probably the one who ordered built the store that appeared on the 1864 land owners map, and which later became the Jenkins Home. During the mid- to late-20th century, the Calwell family lived in the home, after which it was vacated. 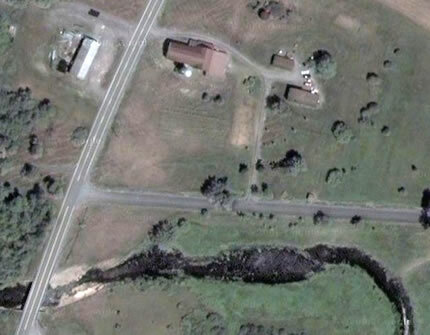 Aerial view of the Benjamin Orchard property; the house is the eastern-most structure. The property was purchased a few years ago by the Surdo family, who has restored the house and barn. 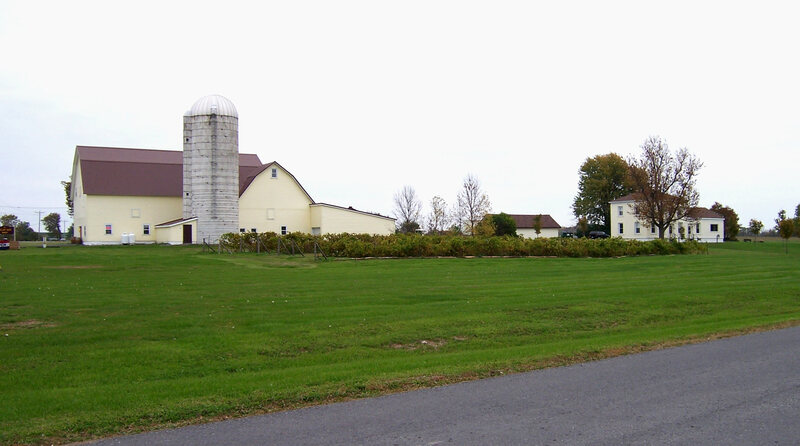 The family currently operates the Yellow Barn Winery on the premises—the first winery in the area. View of the Yellow Barn Winery, October 2006; note the vineyard in the foregraound, and the old Orchard home at right. Childs, Hamilton. "Town of Hounsfield Family Sketches." Gazetteer of Jefferson County (1890). Available at [http://jefferson.nygenweb.net/childhou.htm]. Lane, David. "Old Houses of the North Country Remembered, No.115." Published by the Watertown Daily Times, date unknown (part of series, 1940's-1950's). Available in the Genealogy collection of the Flower Memorial Library, Watertown. © 2001-2006, Mark A. Wentling : : You are the 7291st visitor!